A circle O with radius 1 unit has its center placed at the origin. Let A be its intersection with the x-axis at (1,0) and P be another point on its circumference. 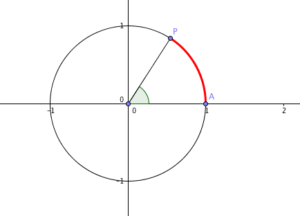 If we move P along its circumference, then we can determine the distance traveled by P. If we let A be the starting point of P as it moves counterclockwise, then the distance traveled by P is equal to the length of arc AP represented by the red arc in the following figure.